Puppy Training Tips from a Pro – ComeHereBoy! Erin Coogan is a great friend of mine. 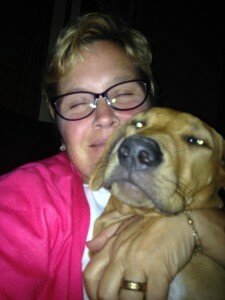 I met her about 7 years ago when I was looking for a Rhodesian Ridgeback puppy and came across her website. The rest is history, and now my kids call her “Auntie Erin” and I still have that awesome puppy (now 8 years old!) she hooked me up with back then. 🙂 I’ve always been impressed with Erin’s ability to clearly and concisely (and bluntly) give you advice and so she was an immediate choice when I thought of someone to interview about puppy training. Erin has been a dog trainer for many years. 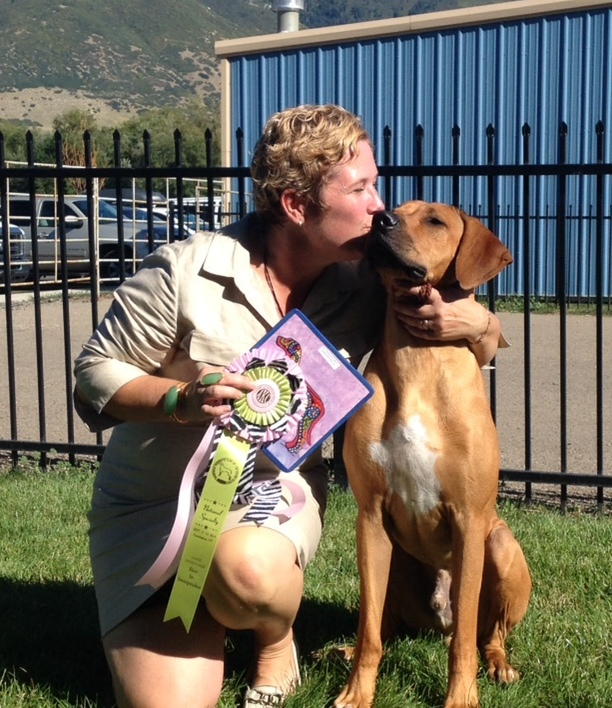 She has trained in competitive obedience and for a long time was a trainer at Lead Me On Dog Training in Utah, until it sadly had to close it’s doors. She currently is teaching community dog training classes in the city of Taylorsville. It can certainly be said that she is passionate about dogs and dog training as evidenced by her years of dedication. 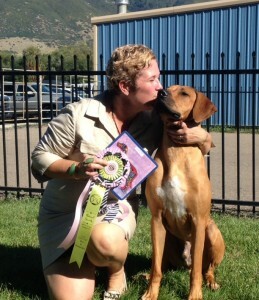 Erin and her friend, Jillyn Myers, currently breed Rhodesian Ridgebacks under the kennel name Aegis. Her website can be found at aegisridgebacks.com, where you can see all sorts of pictures of her beautiful dogs. She’s won many ribbons over the years, but one of the higher profile wins was in 2011 at Westminster Dog Show. She was invited to take her Rhodesian Ridgeback Am/Can GCh Invictus Nightmare Before Xmas, JC (Zero) and the duo took Best of Breed there. Erin has owned several breeds of dogs, including Standard Poodles, Rhodesian Ridgebacks and Tibetan Mastiffs. Throughout the years she has had many litters of puppies running around her house and she provides unmatched support for the puppies she gives to homes, ready with a listening ear for any problem a new owner might have. Today, she’s answered some questions about puppy training for us! 1. When should you start puppy training? A puppy that has been allowed to pee and poop at will and smear it from one side of the planet to the other, is a disaster to potty train and usually has no clue how to even look to the new owner for direction. 2. How often/how long should you work on puppy training? As many short (5-10 minute) sessions as possible each day will get your puppy on obedience track the quickest. A long session becomes boring and frustrating. Play training is absolutely best. Lots of praise and some treats will keep their attention. 3. What are the most important things you should teach a puppy? Erin and Fig, a puppy from her 2014 litter. Crate training HAS to be the most important! Safety and your sanity take precedence! Get your puppy used to having their own space and not needing your every minute of attention. 4. Are there any annoying behaviors puppies will just grow out of without training? Most will stop the incessant chewing, but not all breeds should be treated equally. Most short nosed breeds (in my experience) chew voraciously throughout their lives. Just like their human counterparts, each dog is different. 5. What annoying behaviors, if seen, should you train a puppy not to do? Biting and mouthing should be curbed IMMEDIATELY! This can only lead to something bad. No neighbor will think it’s cute when your 80 lb mastiff puppy puts their mouth on a kid in play. Also, sitting nicely for greeting and treats. 6. What should you expect a puppy under 6 months old to be capable of learning? I’ve never even tried to make a puppy under 6 months or 11 months for that mater, do any sort of stay. I teach a “Wait” which is less strict but requires the puppy to pay attention for a few moments while I fix leash or put something down. I’m not one to set my dog up for failure and frankly, most non-competitive (those not planning to do obedience competitions) pet owners expect way too much from their pups but then don’t follow through… and that then sadly teaches the pup to ignore them. 7. What type of training should you use with a puppy? 8. Anything else people training their puppies should know? Capitalize on the “NO TRICK, TRICK.” If your puppy is doing a desired behavior without being asked… Say the command and PRAISE!!!! If your puppy is being quiet, tell them Good Quiet. If sitting, Good Sit! etc… This is the laziest and most effective way to get your puppy to offer good behaviors. Lastly, ALWAYS end a training session on a good note, even if you want to walk away. One last perfect sit after wrestling with the down command will show the pup that they can’t win every time. Thanks to Erin for her time and answers! These are definitely some great tips to help make puppy training easier. Get my free e-book for solving problems like potty training, jumping and noise by signing up for my online newsletter!